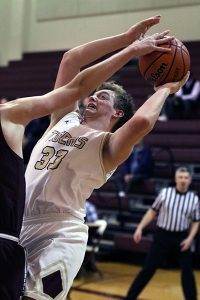 A shorthanded Dripping Springs Tigers boys basketball team succumbed to the Lockhart Lions in a 59-55 loss Tuesday at Tiger Gym. Dripping Springs was a few men short as seniors Enzo Arnold and Nick Statz both sat out due to illness, leaving the Tigers in need of key minutes from their bench. The Tigers got on the board first when junior Trace Young followed his missed shot and came away with the tough put back for two points. Lockhart turned the ball over and junior Xavier Phillips nailed a corner three-pointer off the turnover to give the Tigers an early 5-0 lead. The Lions kicked things into gear offensively, however, leading to a back-and-forth pace. Late in the quarter, Dripping Springs senior Tyler Smith came off the bench to score five points in the final minute to put the Tigers ahead 15-13 after a quarter. Lockhart immediately drew even to begin the second quarter with a mid-range jumper. Tigers senior Colin Dewitt fired back with two of his own and the see-saw battle continued. Dripping Springs played well defensively in the quarter, limiting the Lions to just ten points. Both Young and Phillips recorded a pair of steals, resulting in eight points off turnovers and a 25-23 lead going into the half. Collin DeWitt drives to the basket but has his shot blocked by Lockhart in the third period. The Tigers trailed 41-38 at the end of the third and lost 59-55. But Lockhart connected on its shots in the third quarter after being held down late in the first half. The Lions dropped 18 points on the Tigers in the third frame and began to make the Tigers sweat defensively. Dripping Springs’ offense did just enough to keep the game close. Both Young and senior Kyle Rioux tallied key buckets, while junior Ben Bondurant got hot in the quarter by scoring five points in the third quarter. Lockhart led 41-38 heading into the final quarter. The Tigers took command of the game early in the fourth frame. An 11-2 run in the first few minutes of the quarter had the Tigers back in control. Lockhart did not stay down long however, responding with six unanswered points to reclaim the lead. The Lions knocked down their next eight free throws; Phillips connected on another three-pointer as time expired, but Lockhart’s lead was too much to overcome. Dripping Springs head coach Craig Swannack was proud of his team’s effort and heart in the close loss. The Tigers were led offensively by Young, who tallied 17 points with three rebounds, five steals, and four assists. Phillips finished with eleven points, four steals, and two assists. Phillips also led the Tigers in rebounds with four. Alema Louis recorded eight points with three rebounds, and Tyler Smith recorded six points. Dripping Springs hosts Travis Friday before traveling to play at Crockett to close the regular season. Playoffs begin Feb. 18-19.